Welcome to Megan Mills' Home page! Hi Everyone, and welcome to my home page! Let me introduce myself - my name is Megan, I was born in 1964 and I have been married since 1983. I live in Auckland, New Zealand. I work full time but in my spare time I like to play around with my hobbies (don't we all?). I run a knitting group from my home twice a month and volunteer demonstrating handcrafts at a local museum twice a month too. From as early as I can remember I've loved gardens, flowers, lace, history and handcrafts. I think it was inevitable that my hobbies would end up revolving around those things. I like to share, too and so that is why I have this web site. If you scroll through the icons on the left of this page you'll see my designs and my historical rescues. Of course, clicking on the icons takes you through to that design's web page. I'm putting a picture up of these tiles we've found recently. They are 20cm (8") square cement (concrete) encaustic tiles. There are the main tiles, border tiles and inward and outward corner tiles. 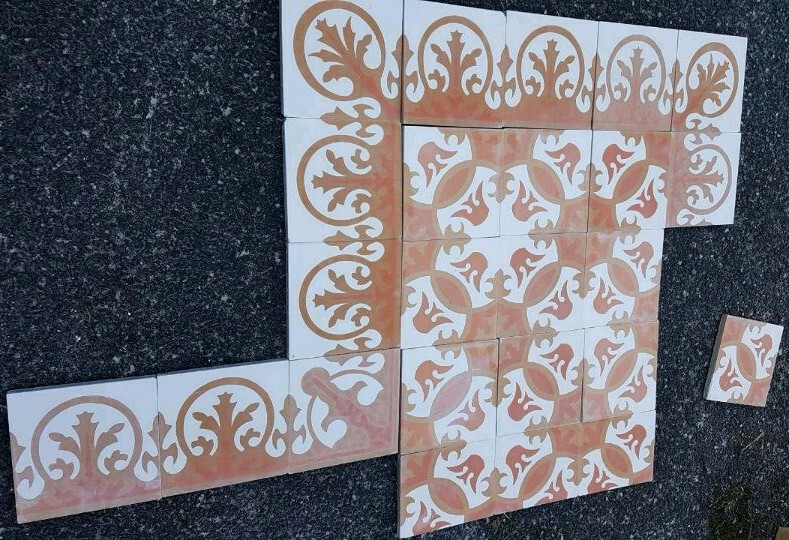 The border tiles aren't necessarily the same "pattern" as the main tiles, but they're the same colour and look to be made by the same manufacturer. We have no other information about them and I'm hoping that one of you might be able to tell me something more. Anything about the name of the pattern or who makes them, a supplier you know who stocks them - whatever - would be wonderful. Please email me if you know anything you think might help.